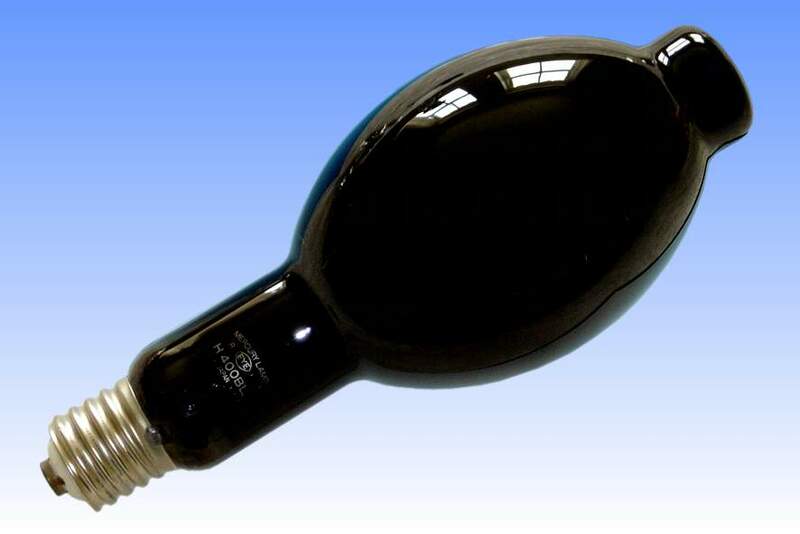 For as long as mercury lamps have been available, they have been recognised as being valuable sources of ultra-violet as well as visible radiation. By employing outer bulbs and arc tubes of various different glasses, particular spectral regions of interest can be isolated for transmission. This lamp is the type known as the Blacklight Mercury, having an outer bulb fabricated from Woods Glass. It is a soft glass type heavily doped with nickel oxide which renders it almost completely opaque to wavelengths of light at the centre of the visible spectrum, but it has a high transmission of ultra-violet and infra-red rays. The only visible wavelengths transmitted are those close to each end of the visible range, i.e. the violet and deep red. In addition, iron oxide impurities in the glass prevent the transmission of ultra-violet below about 320nm, so these lamps do not emit a significant amount of dangerous shortwave UV, and are safe to observe when lit provided the time of exposure is kept within reason. Vision may appear blurred but this is not harmful, it is simply due to fluorescence of the eye itself which can make focussing difficult. The UV output is almost monochromatic centred around the 365.5nm line. Blacklight lamps have a very broad range of applications, nearly all of which involve its employment to stimulate fluorescence. Some of these include mineralogy, the discovery of forged documents and bank notes, identification of materials which have been marked with UV-fluorescing ink, observation of UV markings on stamps and posted letters, or the detection of invisible stains on fabrics. The higher wattage lamps are principally used in theatrical lighting and in the photopolymerisation of artificial rubber. Warm Up / Re-strike Time: 12 minutes 20 minutes max. References: 1) EYE Lamp Catalogue of IBD, 1992.